Now in our 31st year of serving in the region, Steve Bryan purchased the former Owens Funeral Home in Swan Quarter in the summer of 1986. He came to eastern North Carolina with a firm personal commitment to “provide the finest in professional funeral service in the area”, and he has held fast to that commitment since then. In 1994, Edward A. Torres came from Costa Rica to live in the funeral home and complete his high school education at Mattamuskeet School. Following high school, he attended the Funeral Service Education program at Fayetteville Technical Community College in Fayetteville, N. C. , received his Associate Degree in Funeral Service Education, completed the National Board Certification and, following his resident traineeship, received his certification as Funeral Service Licensee from the N. C. Board of Funeral Service. Today he serves as vice-president of our corporation and manages the general day to day activity of our locations and staff. 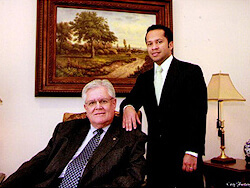 In 2007, we opened a second funeral service facility in Columbia in neighboring Tyrrell County. Beginning with a temporary location, we moved into a newly constructed full service building in early 2009 located at 162 L. A. Keiser Drive, just off the U. S. Highway 64 corridor. This building is completely handicapped accessible and conveniently located with lighted and paved parking. In March of 2015, Bryan Funeral Service purchased the Historic Hampton Academy located at 108 West Main Street in the heart of the historic district of Plymouth, allowing us to provide our services and expertise to the Washington County area. The Hampton Academy is a two story brick building built in 1901 to serve as an educational facility for the citizens of Washington County, and now has been fully renovated into a facility where family and friends gather to honor the lives dear to the community. The history of the academy and Bryan Funeral Service were featured in an industry trade magazine, Southern Calls, in the June, 2017 issue. Our capable support staff surrounds us each day to provide the services that these communities have come to expect from Bryan Funeral Service. We are committed each day to provide “exceptional service beyond expectation”. Bryan Funeral Service is proud to be a part of the day to day activities of Hyde, Tyrrell and Washington counties, and we welcome the opportunity to share in our responsibility as part of the communities we serve. Our staff includes people who are recognized as community people who carefully “make a difference every day”. Our services vary according to your wishes…..alternative methods of funeral service and disposition, traditional services, as well as cremation and memorial services. We offer a full line of funeral merchandise including cemetery memorials which are handled by our subsidiary, Bryan Memorials. Please feel free to call on us….there is never an obligation for an initial conference. Our funeral directors are available at the location nearest you for your convenience.